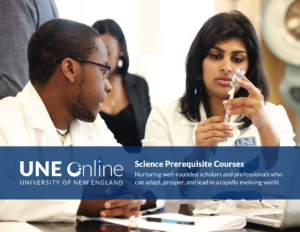 The Science Prerequisite for Health Professions courses at UNE Online are for students who wish to enter a health professions program but need one or two prerequisite courses in order to complete their graduate or medical school application. Most of our SPHP students are either enrolled at another university already, or have actually completed their undergraduate degree and just need one or two classes to satisfy their nursing prerequisites or medical school prerequisites. The University of New England is regionally accredited through the New England Commission on Higher Education (NECHE, formerly known as the Commission on Institutions of Higher Education for NEASC). While you may enroll into our courses at any time, all courses start on the first and third Wednesday of the month. Course registrations need to be completed by noon EST on the Monday before the course opens. Please refer to the Academic Calendar for specific dates. Students may take as many courses as needed in order to meet the prerequisite requirements for the health professions program to which they are applying. Many health professions programs accept these courses but we encourage you to check with the schools to which you are planning to apply to verify that the courses are acceptable before you register. As long as you meet the prerequisites for the individual courses, you may enroll in the post-baccalaureate online science prerequisite courses. You do not need to apply to UNE – you only need to register for the course you need. The courses are self-paced and designed to be completed within 16 weeks. Communicate scientific concepts and information clearly. Illustrate fundamental principles of the scientific method, as well as fundamental laws, theories, and principles of scientific disciplines. Apply knowledge and critical thinking skills to scientific problems. Ask a question or define a problem that can be tested. Plan and/or conduct an investigation individually and/or collaboratively to produce data to serve as the basis for evidence. Analyze data using tools, technologies, and/or models (i.e. computational, mathematical, graphical, etc) in order to make valid and reliable scientific claims or determine an optimal design solution. Communicate the results by constructing an explanation based on multiple pieces of valid and reliable evidence obtained from a variety of sources (including students’ own investigations, models, theories, simulations, peer review) and the assumption that theories and laws that describe the natural world operate today as they did in the past and will continue to do so in the future. Apply scientific ideas, principles, and/or evidence gained from various experiments, as well as other observations and/or research, to provide an explanation of phenomena and solve design problems, taking into account possible unanticipated effects. Questions? Contact our enrollment team at (855) 325-0894. Or, email an enrollment counselor today.